In biology, energy is needed in order to drive all sorts of biochemical processes. Energy is needed to stay alive. There are plenty of energy sources on earth. Tectonic forces release massive amounts of heat and drive the conversion of some minerals into gaseous products; for example, metal sulfides such as zincblende can be converted to gaseous hydrogen sulfide, H2S. Sometimes, all that heat and gas finds its way to the earth's surface in the form of volcanoes. In the oceans, some marine organisms get their energy from gases released from volcanic vents, such as methane and hydrogen sulfide. However, sunlight is an even more abundant source of energy over most of the earth's surface. In photosynthesis, light energy is absorbed and used to make ATP. Remember, ATP is like a portable battery pack in biology; it can travel to different parts of a cell where it can be used to power uphill steps in biochemical reactions. Figure PS1.1. 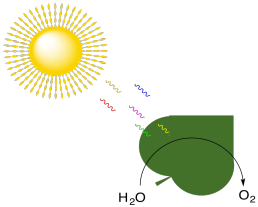 Absorption of photons from the sun is coupled to production of ATP, the biological battery pack. Plants, algae, and some bacteria are capable of carrying out photosynthesis. They could get the immediate benefit of portable ATP molecules to drive biochemical reactions. However, the production of ATP in photosynthesis is also connected to carbon capture. 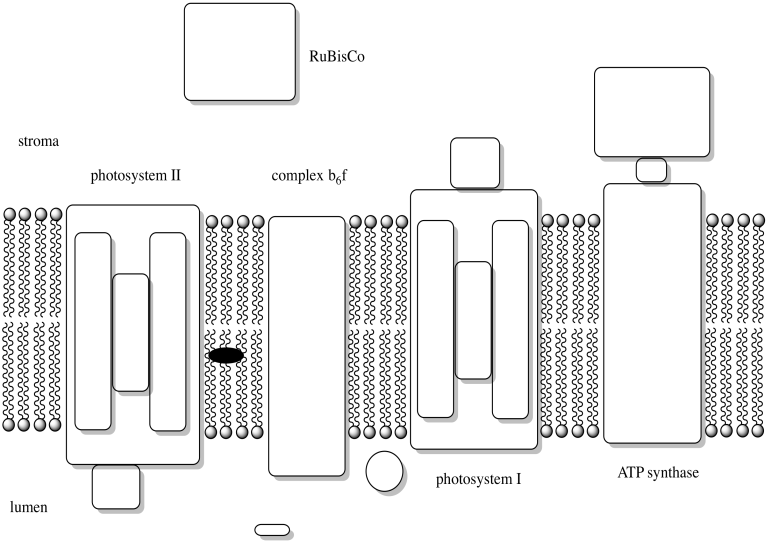 Carbon dioxide from the air is incorporated into carbohydrate molecules. This conversion happens in a series of reactions called "dark reactions", because they keep happening even without sunlight. The carbohydrates can be stored, long-term, and later they can be used as energy sources via glycolysis and the citric acid cycle. Figure PS1.1. 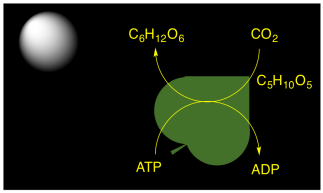 In photosynthesis, the ATP is diverted to carbohydrate production for long-term energy storage. Animals, of course, benefit from this process indirectly because they can also use carbohydrates as a source of energy. The breakdown of carbohydrates releases energy through the usual trade-off: slightly weaker C-H and C-C bonds are broken and slightly stronger O-H and C-O bonds are made, meaning there is an overall release of energy. By eating plants, we can immediately access these carbohydrates without all the fuss of standing in the sun all day making them ourselves. Oxygen is a key player in oxidative phosphorylation, in which glycolysis and the TCA cycle are made even more efficient by boosting the amount of ATP produced for every glucose molecule broken down. Most organisms (including us) just can't survive without that extra ATP; we depend on plants for our survival in more ways than one. But in contrast to what is suggested by the balanced reaction, the production of oxygen by plants is actually carried out separately from carbohydrate synthesis. Production of oxygen is actually part of the "light reaction", along with ATP synthesis. Figure PS1.3. Photosynthesis is also associated with the production of molecular oxygen. In photosynthesis, water is oxidised to produce molecular oxygen. Plants take the electrons that they have stripped from the water molecules and divert them into an electron transport chain. Energy harnessed by that electron transport chain is used to convert ADP to ATP. In oxidative phosphorylation, organisms (including plants) take electrons from NADH and succinate and divert them into an electron transport chain, eventually depositing them onto an oxygen molecule to make water. Energy harnessed by that electron transport chain is used to convert ADP to ATP. That means we have two opposite processes that both are harnessed to produce ATP. In one process, the electrons run downhill energetically and are deposited on dioxygen to make water. That's oxidative phosphorylation. Photosynthesis is really oxidative phosphorylation running in reverse: the electrons start on water and proceed through an electron chain from there. But if oxidative phosphorylation runs downhill, then photosynthesis must run uphill. That's where the light comes in. The light absorbed in photosynthesis is used to lift the electrons uphill in energy; from there, they can start rolling downhill through the electron transport chain, releasing energy along the way that can be harnessed for ATP formation. All of these events take place in a special organelle in the plant called the chloroplast. Chloroplasts are a little bit like mitochondria, where the important metabolic processes such the TCA cycle and oxidative phosphorylation take place. Like mitochondria, chloroplasts contain their own DNA and ribosomes for protein production and they are passed on directly from mother cell to daughter cell. Chloroplasts have a double membrane and are filled with an aqueous medium called the stroma. Figure PS1.4. 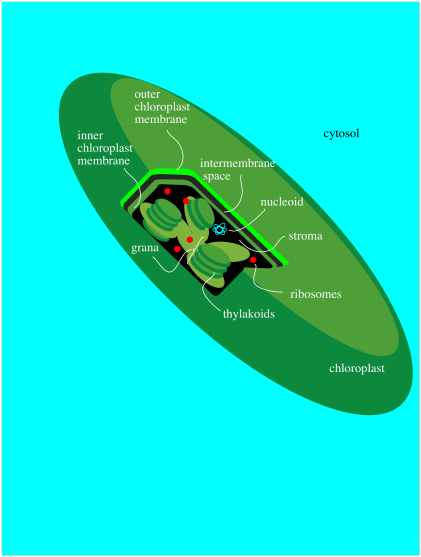 Simplified diagram of a chloroplast. Within the chloroplast there are structures called thylakoids. 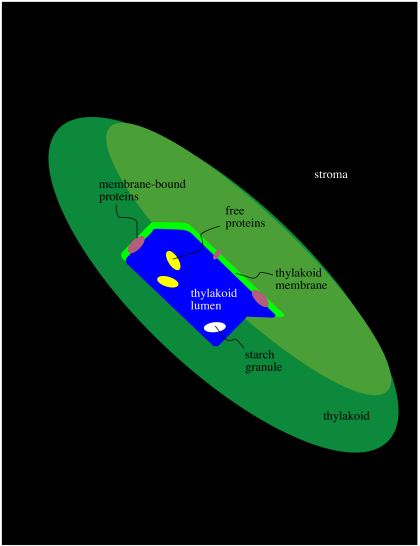 A thylakoid is like a complex water balloon; it has a membrane and is filled with an aqueous medium called the lumen. Unlike a simple water balloon, though, the thylakoid has portions that are deeply folded, so that they look like discs stacked in layers. These portions of the thylakoid are called the grana. The regular, non-folded portions are called the lamellae. Figure PS1.5. Simplified diagram of thylakoid structure. The thylakoid plays a very important role in phtosynthesis. A group of protein complexes bound to the thylakoid membrane carry out the absorption of light energy, the conversion of water to dioxygen, and the production of ATP, as well as an electron carrier, NADPH. The ATP and NADPH are released into the surrounding stroma. A soluble protein in the stroma, called ribulose bisphosphate carboxylase (RuBisCo) captures carbon dioxide and covalently attaches it to a carbohydrate molecule. Other proteins then use the ATP and NADPH to reduce the carboxylate group (from the CO2) into a regular part of the carbohydrate chain. In this way, rather than trying to knit six carbon dioxide molecules together into a glucose, the problem is simplified into just taking up one carbon dioxide at a time, adding it into a pre-existing sugar. The ATP is produced by an ATP synthase, which is very similar to the complex used for the same purpose during oxidative phosphorylation. Just like the ATP synthase in the mitochondria, this one is driven by a proton gradient. The proton gradient is created through an electron transport pathway, just like the one in the mitochondria. In fact, many of the features of photosynthesis are pretty similar to oxidative phosphorylation. A crucial difference is that the electron transport chain in oxidative phosphorylation starts with NADH and ends with water, whereas in photosynthesis it is the reverse: the chain starts with water and ends with NADPH. The electron transport chain in oxidative phosphorylation is exothermic, running downhill in energy. The electron transport chain in photosynthesis would be endothermic, but can be sustained by the input of energy in the form of light. Figure PS1.6. Simplified diagram of the major participants in photosynthesis. See the section on photosynthesis at Henry Jakubowski's Biochemistry Online.